The sites are intended for practical conservation for posterity, which otherwise would be subject to risk from human or animal trespassing, unmonitored/uncontrolled/unrestricted access, or threat from local administrative negligence. Sites are demarcated by UNESCO as protected zones. The list is maintained by the international World Heritage Program administered by the UNESCO World Heritage Committee, composed of 21 UNESCO member states which are elected by the UN General Assembly. The program catalogues, names, and conserves sites of outstanding cultural or natural importance to the common culture and heritage of humanity. Under certain conditions, listed sites can obtain funds from the World Heritage Fund. The program began with the Convention Concerning the Protection of the World's Cultural and Natural Heritage, which was adopted by the General Conference of UNESCO on 16 November 1972. Since then, 193 state parties have ratified the convention, making it one of the most widely recognized international agreements and the world's most popular cultural program. As of July 2017, 1,073 sites are listed: 832 cultural, 206 natural, and 35 mixed properties, in 167 states. 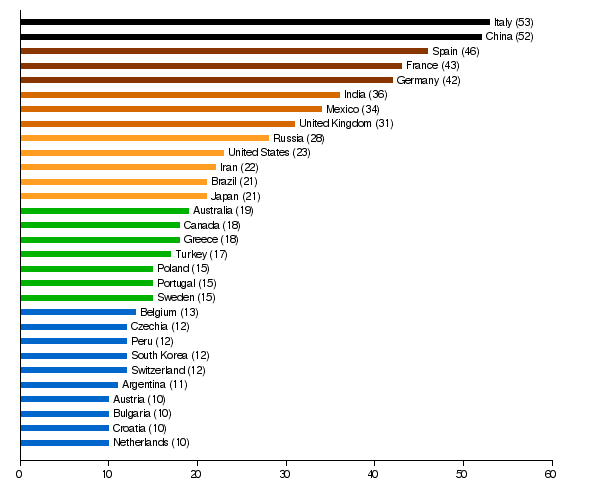 The Table of World Heritage Sites by country lists Italy as the home for the largest number of sites with 53, followed by China (52), Spain (46), France (43), Germany (42), India (36), Mexico (34) and United Kingdom and British Overseas Territories (31). Template:Infobox treaty In 1954, the government of Egypt decided to build the new Aswan High Dam, whose resulting future reservoir would eventually inundate a large stretch of the Nile valley containing cultural treasures of ancient Egypt and ancient Nubia. In 1959, the governments of Egypt and Sudan requested UNESCO to assist their countries to protect and rescue the endangered monuments and sites. In 1960, the Director-General of UNESCO launched an appeal to the Member States for an International Campaign to Save the Monuments of Nubia. This appeal resulted in the excavation and recording of hundreds of sites, the recovery of thousands of objects, as well as the salvage and relocation to higher ground of a number of important temples, the most famous of which are the temple complexes of Abu Simbel and Philae. The campaign, which ended in 1980, was considered a success. As tokens of its gratitude to countries which especially contributed to the campaign's success, Egypt donated four temples: the Temple of Dendur was moved to the Metropolitan Museum of Art in New York City, the Temple of Debod was moved to the Parque del Oeste in Madrid, the Temple of Taffeh was moved to the Rijksmuseum van Oudheden in the Netherlands, and the Temple of Ellesyia to Museo Egizio in Turin. The project cost $80 million, about $40 million of which was collected from 50 countries . The project's success led to other safeguarding campaigns: saving Venice and its lagoon in Italy, the ruins of Mohenjo-daro in Pakistan, and the Borobodur Temple Compounds in Indonesia. UNESCO then initiated, with the International Council on Monuments and Sites, a draft convention to protect the common cultural heritage of humanity. Only two sites have ever been delisted: the Arabian Oryx Sanctuary in Oman and the Dresden Elbe Valley in Germany. The Arabian Oryx Sanctuary was directly delisted in 2007, instead of first being put on the danger list, after the Omani government decided to reduce the protected area's size by 90 percent. The Dresden Elbe Valley was first placed on the danger list in 2006 when the World Heritage Committee decided that plans to construct the Waldschlösschen Bridge would significantly alter the valley's landscape. In response, the Dresden City Council attempted to stop the bridge's construction, but after several court decisions allowed the building of the bridge to proceed, the valley was removed from the World Heritage List in 2009. The first global assessment to quantitatively measure threats to Natural World Heritage Sites found that 63 percent of sites have been damaged by increasing Human pressures including encroaching roads, agriculture infrastructure and settlements over the last two decades. These activities endanger Natural World Heritage Sites and could compromise their unique values. Of the Natural World Heritage Sites which contain forest, 91 percent of those experienced some loss since the year 2000. Many Natural World Heritage sites are more threatened than previously thought and require immediate conservation action. There are 1073 World Heritage Sites located in 167 states. Of these, 832 are cultural, 206 are natural and 35 are mixed properties. The World Heritage Committee has divided the world into five geographic zones which it calls regions: Africa, Arab States, Asia and the Pacific, Europe and North America, and Latin America and the Caribbean. Russia and the Caucasus states are classified as European, while Mexico and the Caribbean are classified as belonging to the Latin America & Caribbean zone, despite their location in North America. The UNESCO geographic zones also give greater emphasis on administrative, rather than geographic associations. Hence, Gough Island, located in the South Atlantic, is part of the Europe & North America region because the government of the United Kingdom nominated the site. *The property "The Architectural Work of Le Corbusier, an Outstanding Contribution to the Modern Movement" (Argentina, Belgium, France, Germany, India, Japan, Switzerland) is a trans-regional property located in Europe, Asia and the Pacific and Latin America and the Caribbean region. It is counted here in the Europe and North America. Countries with ten or more World Heritage Sites, as of July 2017. A number of listed World Heritage locations such as George Town, Penang and Casco Viejo, Panama have struggled to strike the balance between the economic benefits of catering to greatly increased visitor numbers and preserving the original culture and local communities that drew the recognition. ^ Centre, UNESCO World Heritage. "The Criteria for Selection" (in en). http://whc.unesco.org/en/criteria/. Retrieved 1 February 2018. ^ "World Heritage". Archived from the original on 30 June 2009. http://whc.unesco.org/en/about/. ^ "The World Heritage Committee". UNESCO World Heritage Site. Archived from the original on 9 November 2006. http://whc.unesco.org/en/comittee/. Retrieved 14 October 2006. ^ World Heritage List Script error, UNESCO World Heritage Sites official sites. ^ Sites in Germany and Italy bring to 19 the number of sites inscribed on the World Heritage List this year Script error, UNESCO World Heritage Sites official sites. ^ Convention concerning the Protection of the World Cultural and Natural Heritage: Treaty status Script error. ^ a b c d e "The Operational Guidelines for the Implementation of the World Heritage Convention". UNESCO. Archived from the original on 14 July 2017. http://whc.unesco.org/en/guidelines/. Retrieved 10 July 2017. ^ "Criteria for Selection". World Heritage. Archived from the original on 12 June 2016. http://whc.unesco.org/en/criteria/. Retrieved 14 October 2006. ^ "UNESCO World Heritage, The Criteria for Selection". Archived from the original on 12 June 2016. http://whc.unesco.org/en/criteria/. ^ UN General Assembly (1979) [8 June 1977]. "UN Treaty No. 17512" (PDF). 'Volume 1125-1' UN. Treaty Series. p. 27. Archived from the original on 9 March 2012. http://treaties.un.org/doc/Publication/UNTS/Volume%201125/volume-1125-I-17512-English.pdf. ^ "List of World Heritage in Danger". UNESCO. Archived from the original on 21 March 2015. http://whc.unesco.org/en/158/. Retrieved 10 July 2017. ^ "Oman's Arabian Oryx Sanctuary: first site ever to be deleted from UNESCO's World Heritage List". UNESCO. Archived from the original on 18 January 2008. http://whc.unesco.org/en/news/362. Retrieved 10 July 2017. ^ "Dresden is deleted from UNESCO’s World Heritage List". UNESCO. Archived from the original on 7 July 2017. http://whc.unesco.org/en/news/522. Retrieved 10 July 2017. ^ UNESCO World Heritage Centre. "World Heritage List Statistics". unesco.org. Archived from the original on 14 May 2011. http://whc.unesco.org/en/list/stat. ^ UNESCO World Heritage Centre. "UNESCO World Heritage Centre - World Heritage List". unesco.org. Archived from the original on 27 October 2014. http://whc.unesco.org/pg.cfm?cid=31&l=en&&&&mode=table&order=region. ^ Barron, Laignee (30 August 2017). "'Unesco-cide': does world heritage status do cities more harm than good?". The Guardian. https://www.theguardian.com/cities/2017/aug/30/unescocide-world-heritage-status-hurt-help-tourism. Retrieved 3 September 2017. ^ Vallely, Paul (7 November 2008). "The Big Question: What is a World Heritage Site, and does the accolade make a difference?". The Independent. Archived from the original on 27 October 2016. https://web.archive.org/web/20161027192333/http://www.independent.co.uk/news/world/politics/the-big-question-what-is-a-world-heritage-site-and-does-the-accolade-make-a-difference-997955.html. ^ "Modernist masterpieces in unlikely Asmara". The Economist. 20 July 2016. Archived from the original on 15 July 2017. https://web.archive.org/web/20170715102559/https://www.economist.com/blogs/prospero/2016/07/architecture-eritrea?zid=317. ^ Slezak, Michael (26 May 2016). "Australia scrubbed from UN climate change report after government intervention". The Guardian. Archived from the original on 27 October 2016. https://web.archive.org/web/20161027130133/https://www.theguardian.com/environment/2016/may/27/australia-scrubbed-from-un-climate-change-report-after-government-intervention. ^ Hasham, Nicole (17 September 2015). "Government spent at least $400,000 lobbying against Great Barrier Reef 'danger' listing". The Sydney Morning Herald. Archived from the original on 28 December 2016. https://web.archive.org/web/20161228235450/http://www.smh.com.au/federal-politics/political-news/government-spent-at-least-400000-lobbying-against-great-barrier-reef-danger-listing-20150914-gjlwr2.html. ^ Maurel, Cholé. "The unintended consequences of UNESCO world heritage listing". The Conversation. https://theconversation.com/the-unintended-consequences-of-unesco-world-heritage-listing-71047. Retrieved 4 September 2017.